Gypsy Kids: Our Secret World returns for a second series on Channel 5. With unprecedented access to children within the Gypsy and Traveller community; this documentary series explores their world, through their eyes. These children revel in the freedom of a gypsy childhood while facing prejudice and even eviction from an early age. Demonstrating maturity beyond their years, they offer an insight into one of the most marginalised yet resilient communities in the UK. Gypsy Kids: Our Secret World informed 1.1m (6.1%) across the 45-minutes from 9.15pm. In Birmingham, tensions are running high in this explosive first episode. 9 year old Irish Traveller Margaret and her cousins are being evicted by bailiffs and police every 7 days. They recently pulled their trailers onto a school playground and 900 children had to stay home for the day. But Margaret and her family don't understand why the community is so angry. "They've missed one day, we've not been to school our whole lives because we keep having to move". Meanwhile 9 year old Indianna is moving out of her trailer and into a chalet on her family's site. For the first time she will be able to use the bathroom inside her home and sleep in her own bed. And 14 year old Jamsey is dreaming of a place to call home. He’s living on a piece of land that was previously a dumping ground. Jamsey and his family have cleaned it up but if the council evict them from here, they will have nowhere else to go. 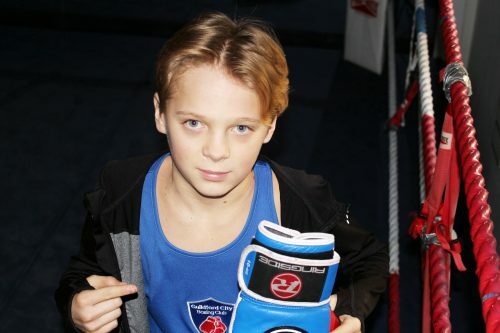 Keen to impress his Dad and earn himself a solid reputation in the Travelling Community, 11 year old Albert is gearing up for his first ever competitive boxing match. Cheered on from the sidelines by his charismatic younger brother Michael, Albert is feeling the pressure. Traveller twins Johnny and Abraham are attending a catapult competition. Vying to be crowned the best in the country they'll need to use regulation ball bearings, instead of their preferred type of ammunition - stones. "The thing is, you've got to find the right stone". And 11 year old English Traveller Sheri-Anne is keeping Gypsy traditions alive by proving her talents on the back of a horse. A keen equestrian vaulter, she is risking life and limb to accomplish the ‘standing canter’, a move that requires her to stand up on a moving horse with no hands. 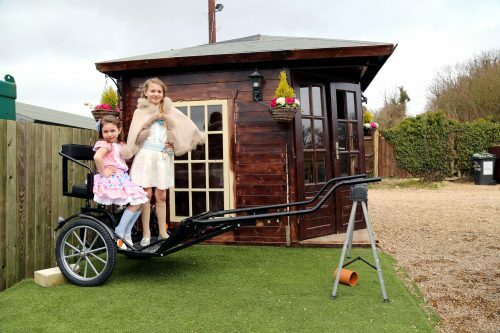 8 year old Ellie-May has been teased at school for being a Gypsy. 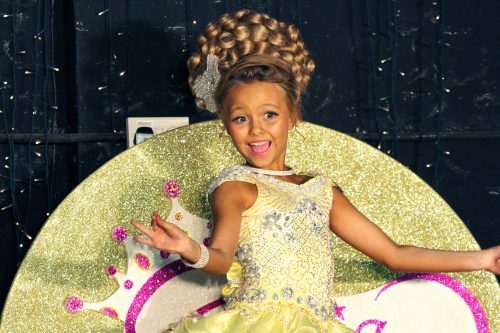 But armed with her fake tan and sequinned dresses, she’s now hoping to shine as she takes on the non-Traveller girls in a bid to be crowned queen of the Pageant circuit. Having overcome his own battles with the bullies, 15 year old David is now honing his skills as a trader and is on a mission to raise enough money to transform a run-down caravan into a place he can call ‘home'. And, having been brought up as a traditional Traveller girl, Nicole is dreaming of stepping away from her domestic duties to sing in a Gypsy talent show. But unless 9 year old Margaret and her grandad Paddy Doherty can pull the show together in time, those dreams will have no chance of getting off the ground. This week the Gypsy Kids are standing up for themselves. 13 year old Ben has been bullied out of no less than 10 schools because he is a Gypsy. He has channeled his frustrations and decided to speak out on stage at a London conference. But will his nerves get the better of him? 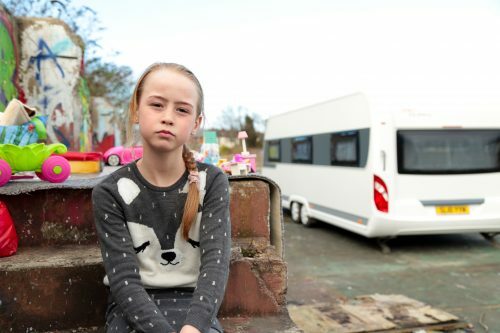 10 year old Scarlett lives on a council run Traveller site. It’s been there for generations but unfortunately, a developer wants to build a shopping centre on top of it. Scarlett and her family are being moved to a new location by the council. The children from the site go exploring to find the proposed location and are left devastated when they learn it’s in the middle of the woods. They are compelled to protest outside their site in a desperate attempt to prevent the move. 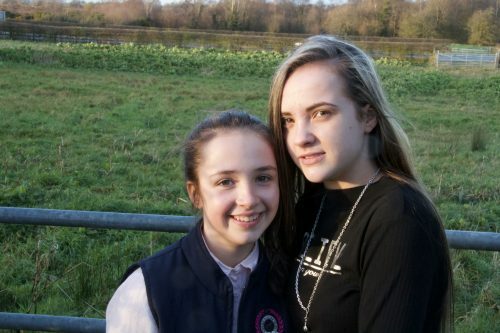 At just 10 years old, English Traveller Rhiann has faced more than her fair share of bullying. Her Mum has removed her from school as a result. Rhiann dreams of being an actress but when an opportunity to audition for a top agency arises, it becomes apparent that Rhiann’s reading has suffered due to her time away from the classroom. Not to be deterred, Rhiann makes the choice to return to school to ensure the bullies don’t hold her back. 16 year old Jessie is breaking the mould. She wants to be taken seriously as a female boxer and her family will support her, as long as she keeps on top of her cleaning. The Traveller and Gypsy Kids are being schooled... whether that’s in the classroom or in the school of life. 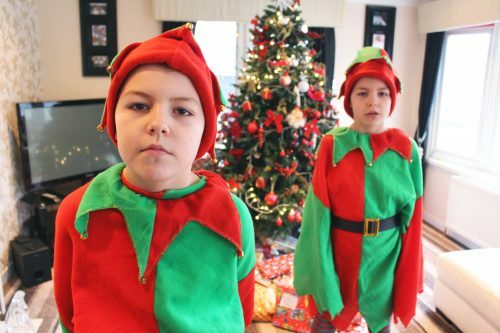 9 year old Paddy wants to follow in his older brother Jimmy’s footsteps and leave school. Jimmy left school at 11 but thinks little Paddy should stick it out for a few more years, at least until he can do basic maths. Jimmy is lucky to attend the only school in the country where over 90% of the students are from the Travelling community. The school offers Paddy his best chance of academic success but does he want to take it? 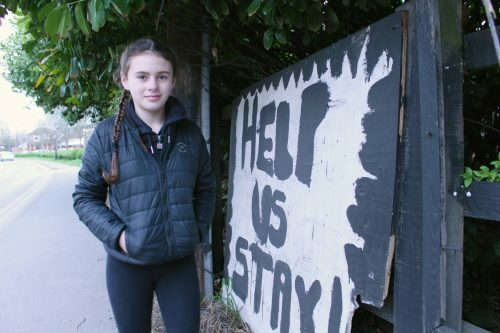 11 year old English Traveller Shannon is celebrating her final term in education as she is about to follow family tradition dating back to her grandmother and leave school at 11. Instead of wasting her time with maths and science, her Mum is keen to teach her how to be a good housewife and mother as these are the skills she will be using in her future. 9 year old Michael is still in school and his parents want him to stay in. But his Grandfather is keen he learns the skills he will use in a few years time alongside his academic studies. At just 9 Michael demonstrates that he can jump start a car, lay block paving and drive, all skills he will need when he goes to work for himself. This episode revisits series favourite Ben. It appears his celebrations at finding a new school have been short lived as he has been attacked… again. This time he has wound up in A&E. Leaving his 11th school due to bullying is a big decision for Gypsy Ben and it seems that he’s arrived at a crossroads. Is this the end of his time in education for good? 15 year old Margaret has recently moved from a Traveller site in Ireland into a house due to her brothers’ health. Her family found it near impossible for medical supplies like oxygen to be delivered and they made the choice to leave. Sadly now it is Margaret who is suffering as other Traveller kids are bullying her for not ‘being Traveller enough’. Her family have decided to make a pilgrimage to Mount Croagh Patrick to pray for some good fortune, but the summit is over 2000 feet. Have they taken on more than they can handle? 12 year old Shakiera has a different kind of battle on her hands. She is determined to prove that Traveller girls can do anything that a Traveller boy can do. When she’s not learning to be a farrier and shoe horses, she’s in training. Shakira wants to be a professional boxer. She’s determined and it seems she may just get her chance. The Christmas special. We’ve enjoyed a glimpse into the secretive world of the Traveller community and now they are opening their doors one last time for this festive treat. Series favourites Johnny and Abraham, English Traveller twins are attending their uncle’s festive cage fight. He wants to go as bad santa and he needs some elves to make his entrance something really special. Can the boys step up to the plate or will they be on Santa’s naughty list? Johnny is a bit bored this winter so has decided to organise a Christmas nativity with friends on his Traveller site. Reenacting the story of Mary and Joseph with their own unique twists. As the show’s director has Johnny organised a show stopper or will the performance be “shameful”. 8 year old Margaret is extra excited this Christmas. Santa is getting her a new chalet. It's time to move out of the trailer and into a spacious mobile home. She’s off furniture shopping with her Grandad Paddy for unique pieces like a 6 foot stiletto-shaped book shelf. But there’s been a hold up at the factory. Will Margaret's chalet arrive in time to put the Christmas tree up? The last in the series. The Traveller and Gypsy kids are growing up fast and finding their independence. 9 year old English Traveller Jack Joe has decided that he is old enough to move out of the family chalet and into a trailer of his own. To mark his independence his dad is letting him buy a 3 wheel motorbike and conduct the deal by himself. But he doesn’t need to confirm the price before they shake hands - “I’ve got my own money”. Francie, Johnny and Margaret are 3 of Simey Doherty's 150 grandchildren and great grandchildren. Called ‘The King of the Dohertys’, Simeys death has sent shockwaves through the Traveller community and hundreds will be attending his funeral. A procession of 16 Rolls Royces, Irish dancers in the church and releasing doves are not enough for this send off. 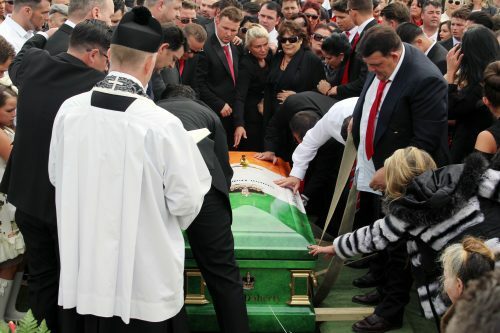 The Doherty family have one big surprise up their sleeve to ensure that everyone will be talking about this funeral for years to come… as long as the police don’t get wind of it first.